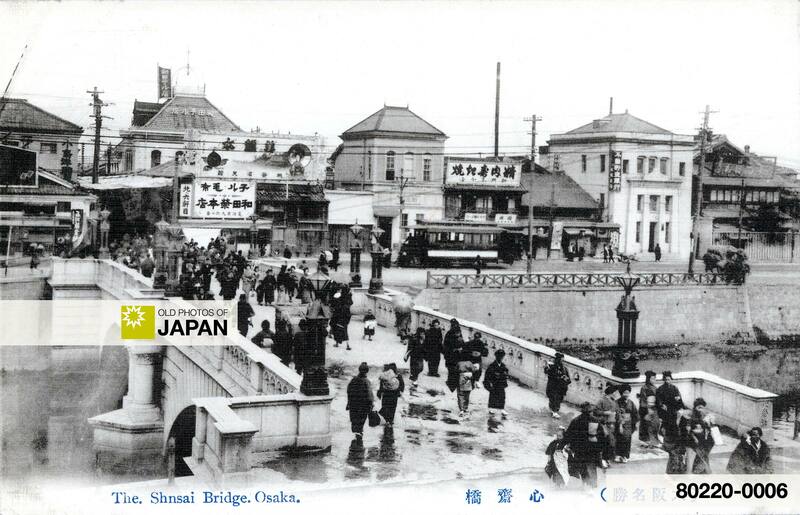 The Shinsaibashi Bridge in Osaka’s Minami district sometime during the 1910s. The Bridge was named after Shinsai Okada, one of four merchants who dug the Nagahori canal that flowed below the bridge. This image shows the stone bridge which in 1909 (Meiji 42) replaced the steel bridge built in 1873 (Meiji 6). For a photo of the steel bridge, and the history of Shinsaibashi Bridge, see Osaka 1890s • Shinsaibashi Bridge. You can also licence this image online: 80220-0006 @ MeijiShowa.com.